Masshole Sports: Just A Reminder, ESPN The Magazine Predicted That The Patriots Wouldn't Even Make The Playoffs This Year. Stupid Fucks. 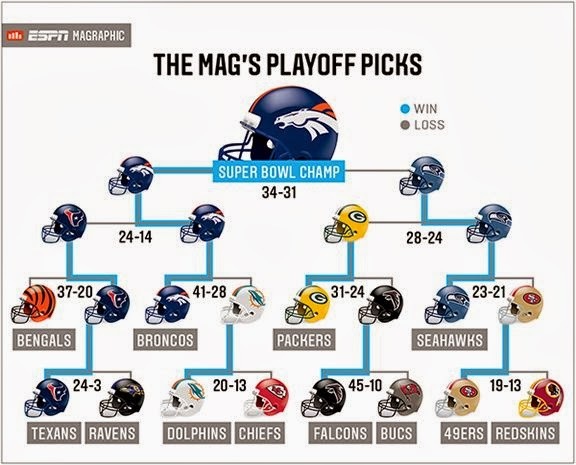 Just A Reminder, ESPN The Magazine Predicted That The Patriots Wouldn't Even Make The Playoffs This Year. Stupid Fucks. ESPN really has to stop with these predictions. Its getting embarrassing. Predicting that the Patriots wouldnt make the playoffs is ignorant. Predicted that the Broncos will win the Super Bowl, despite Peyton Manning's horrendous career playoff history, is just stupid. They need to stick to showing highlights and broadcasting games and stop pretending to know football.